My understanding is that Germans are not as heavily invested into the stock market as the US, but a 15% drop in you countries main market index surely catches the attention of politicians. From the chart below, the majority of the loss took place in the just the first part of August when the index plunged from around 7,200 to 5,600. Some might doubt the willingness of Germany to bailout the Southern Europeans, but such moves suggest they have more incentives than most people would think. Don't look now, but food inflation in India is now under control. 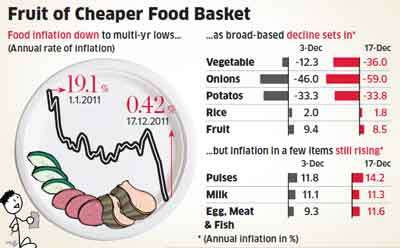 Prices of primary food items rose only 0.4% in the week ended December 17 from a year ago. Lower food inflation places less strain on the economy and lowers the overall inflation rate allowing the RBI to begin easing monetary policies. Rates were increased 13 times since March 2010 and has started having a major impact on growth. Inflation is expected to drop to around 6% in the next few months and maybe lower if food prices are any indication. 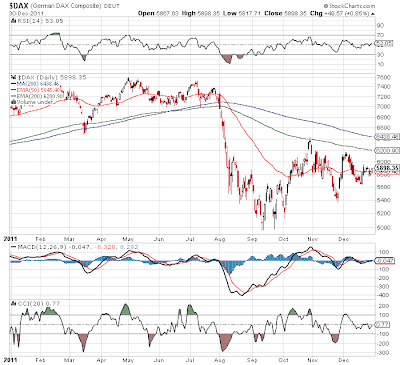 As I wrote recently for Seeking Alpha, India stocks are ripe for buying as inflation comes under control. A lot of the fears were misplaced as the sharp drops in commodities from the credit crisis lead to artificially inflated price increases by the start of 2011. Now after some cooling of growth, inflation rates have dropped dramatically and as the world economy goes into 2012, prices for most commodities will show year over year declines. The HSBC Purchasing Manager's Index inched up to 48.7 in December from 47.7 in November. Though still negative it is a number that economists equate with 12-12 percent industrial output. The number has been holding just sub 50 since July so at least the stability is suggestive of a soft landing. Not to mention China has already begun an easing process that should help going forward. Lower inflation followed by low PMIs will allow for quicker policy cuts especially on bank reserves. HSBC Purchasing Manager's Index inched up to 48.7 in December from a 32-month low of 47.7 in November but fell short of the flash reading of 49. HSBC believes a PMI reading of as low as 48 in China still points to annual growth of 12-13 percent in industrial output. Still, analysts are looking for signs of stabilisation in the factory sector and are anticipating a shift by Beijing to a more supportive economic policy stance to prevent a sharp slowdown. Are Surging Land Prices in Shale Oilfields Sustainable? Interesting article from the Financial Times about a subject I've wondered about as well. Will the surge in land prices for US shale oilfields last? Every time you read an article, one wonders why Chesapeake Energy (CHK) can't translate purchases of acres at $1,400 that is sold for $15,000 into huge stock price gains. Also, it amazes me that none of the major energy companies with vast cash hoards aren't able to beat CHK to the punch for cheap acres. Ultimately the issue with Chesapeake is that it requires a ton of debt to grab all this land and hold onto it until it is able to drill and recover oil or nat gas. After an amazing decade run, Gold (GLD) has finally run out of steam. Nobody seems to know why gold would collapse now if Europe still a disaster area. Probably more that the trade became too crowded. Never was a fan of owning the physical commodity, but clearly it was a profitable trade. 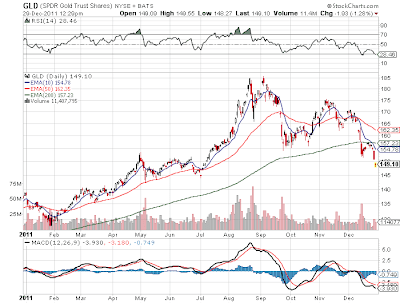 Anybody still owning gold should be careful as the GLD has broken solidly below the 200ema. No reason for Gold to remain in the $1,500 level. Update: Interesting post from Seeking Alpha. Note the huge difference in performance for Gold versus the Dow would make me concerned about owning last decades winner and this decades loser. Earnings records were a big focus in the first part of 2011. Most analysts debated whether the SP500 would report 2012 earnings 5,10, or 15% above the record numbers already expected in 2011. Slap a 15 multiple on those numbers and estimates for 2012 could easily hit 1,500 to 1,650. Fast forward to a rough summer with heightened fears of another recession as 2011 ended and the focus on the record earnings disappeared. Hardly anybody discusses earnings anymore. It was interesting to see this Investment News article where David Cote of ING forecast 7% earnings growth in 2012 to $105. Slap a 15 multiple on those estimates and the SP500 could reach 1,575. That would be right around the record high. After about 14 months of running a Net Payout Yields Model on Covestor, I'm still stunned how few people understand the concept or even incorporate it into investing. Net Payout Yields are the combination of the ever popular dividend yield and the always controversial net stock buyback yield. Or another way, the yield a company pays out to shareholders. No preference is given to whether the yield is obtained via dividends or buybacks. It seems that most investors are in love with the dividend paying stocks, but hardly anybody can get behind stock buybacks. Oddly though, very few investors take advantage of the combination. Disclosure: Long DTV, LMT, TRV, LO, WLP. Please read the disclaimer page for more details. Carrizo Oil & Gas (CRZO) achieved its oil production per day goal by reaching the objective of 5,000 net barrels by the end of 2011. In fact, production surpassed the goals by 20% with the oil production on December 26th reaching 6,040 barrels. CRZO has had a challenging time of meeting quarterly targets so this should be seen as significant news. Not only that, but it is already forecasting 7K barrels from the Eagle Ford alone by the end of 2012. This doesn't include anything from the Niobrara or any other fields. Amazingly the stock is flat for the day as the markets ignores the good news. Magnum Resources soared 17% yesterday on similar news. Not sure what else the market wanted, but this provides the new investor an opportunity to jump onto a proved fast growing producer at a cheap valuation. 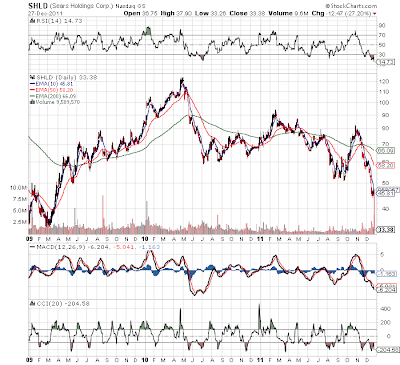 Today Sears Holdings (SHLD) provided a Q4 update that was very disappointing to the markets. Exactly why it was that disappointing or surprising goes to show how few investors exist these days. Too many traders jump on the headlines as perceived grossly negative and begin pounding the stock down. At the end of the day, the stock was down an amazing 27%. What was so devastating about today's news that sunk the stock? Well, honestly we're still not that sure. Comp sales are down 5% QTD and EBITDA will be roughly half of last year. Anybody paying attention should've known the numbers wouldn't be that great. The other news was that up to 120 stores would be closed. While sounding negative, that has been the plan at SHLD for a very long time. The weak stores are closed so that the inventory can be turned into cash and the stores can be sold or leased. 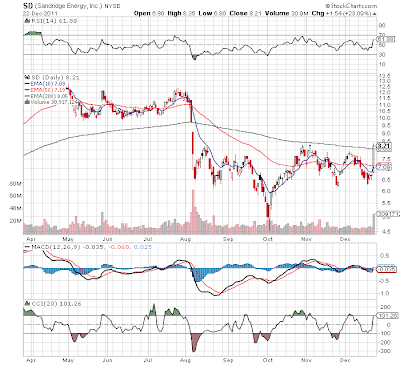 Does Sandridge Energy Have the Perfect Inverse H&S Chart? Anybody following this blog knows that I've been talking about the inverse Head & Shoulders charts that have shown up lately. The Oil Services (OIH) still has potential as well as the numerous other individual stocks including the one I've mentioned. Today though Sandridge Energy (SD) highlighted how the chart works to perfection. Not only does SD have what amounts to a near perfect shoulder setup, but the stock rocketed 23% on a JV deal. This move helped form what ultimately could be the breakout above the neckline right around todays close around $8. Looks like a move straight up to $12 might be possible now. Anybody catching that reversal near $4.5 in early October is sitting very strong right now. See chart blow. Disclosure: No positions mentioned. Please review the disclaimer page for more details. Update 12/23 2:40pm: SD jumped to $9 today, but has since fallen back to $8.5. Looks like a clear breakout though the stock quickly stalled. This report is very behind schedule this month, but I thought it was worth writing anyway. This model continues to work well and the word needs to get out more about the advantage of net payout yields over just focusing on dividends. November was yet another solid month, with a 0.05% gain for this portfolio, on both a relative and absolute basis, as the benchmark S&P 500 lost 0.51%. When the market has down months this model continues to shine and overtime the results become much more evident. For the last 12 months, the portfolio was up 12.72% versus the 5.63% for the benchmark. Despite all the volatility in the markets, the Net Payout Yields Model has had a great absolute and relative performance. This is the 4th article in a series focusing on the investing opportunities in emerging markets presented by the large selloff during 2011. The first 3 articles focused on India, Brazil, and China respectively. Russia will be the focus this time and the country is no different than the others where inflation has been a big factor to the market declines. Russia inflation fell to 6.8% in November. In most economies, 7% inflation would be disastrous and even in other emerging markets like China and Brazil that amount would be extremely high. In Russia though, 7% inflation has actually been closer to the lows over the last couple of decades. Jobless claims continue to drop towards the mid 300K level. A number generally consistent with solid jobs growth, but not near the lows of 300K in the mid 2000s. 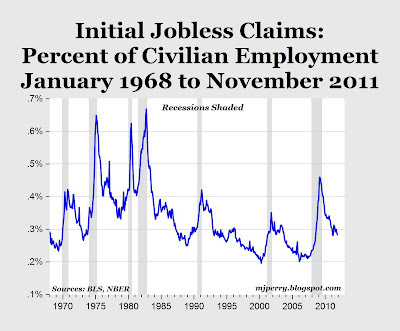 Mark Perry has a great chart showing the jobless claims as a percentage of the civilian workforce. The jobless claims number provides the absolute number of how many looking for a job, but it does a poor job of relating the relative change of the number over time. As the workforce increases over the decades, the absolute total of jobless claims will rise adjusting what should be considered normal claims levels. Unfortunately the market doesn't accurately grasp these changes. Most economics and analysts on tv still subscribe to the numbers from the '80s and '90s when the labor force was much smaller. This morning Teva Pharma (TEVA) released their financial outlook for 2012. TEVA is the leading generic drug maker in the world and is based in Israel. The numbers were generally in line with expectations and on a fundamental basis appear very appealing. Stock traded at $42 and the company guided to $5.58. Anybody doing simple math can probably conclude that a continue earning that much money and trading at only 7x estimates is cheap. For our Net Payout Yields model though, the fundamental picture such as PE ratio and earnings growth just don't matter. 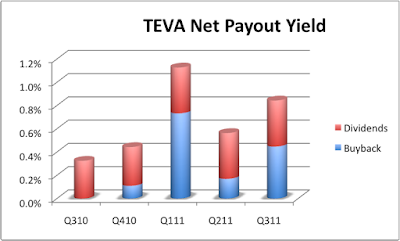 What matters is that TEVA announced a $3B stock buyback and the potential for dividend hikes. As compared to the $5B buyback announcement of Oracle (ORCL) yesterday, the TEVA deal amounts to 8% of the current outstanding stock with company having a $37B market cap. Though missing earnings and revenue estimates, Oracle (ORCL) announced an additional $5B stock buyback program. Unfortunately the earnings report lacks details on the Q112 details regarding stock buybacks. Having a model that focuses on Net Payout Yields (NPY), combination of net stock buybacks and dividends, these headlines naturally grab our attention for future additions to the model. 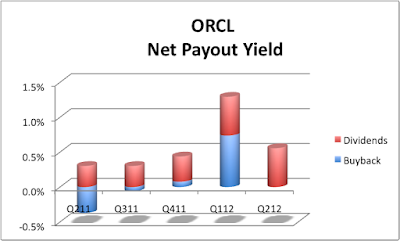 Considering ORCL has a roughly $150B market cap, a $5B stock buyback is not likely to make the top of the list. The small dividend doesn't help much either. This isn't that surprising as most of the large tech companies have piles of cash and strong earnings, but most of them like CSCO and MSFT still only have NPY yields in the 5-6% range. The companies are cheap on the payouts or the market caps are too expensive to get top yields. Spain's Treasury had a very positive auction this morning leading to plunging rates for 3 & 6 month bonds. Though getting some play in the media, these auction results are being somewhat ignored. Not that the market has ignored them with the roughly 3% rise in US markets. sold €3.7 billion in three-month bills at 1.735%, compared with 5.11% in November sold €1.9 billion of six-month paper at 2.435%, compared with 5.227% last month. What debt crisis? Or at least in the case of Spain. Maybe it will only be a short term phenomenon as this comes one day prior to the ECB launches new three-year lending facilities for the area's banks. This is the 3rd in a series or articles focusing on the emerging markets that have come under fire this year. The first 2 articles focused on India and Brazil, while this one will explore the opportunities in China. The main culprit for the emerging market declines has been the supposed rampant inflation. China has been no exception to this fear. Inflation, though, has decidedly peaked in China with the November figure showing month over month declines. This has allowed China to lower bank reserve ratios once already and will likely lead to further cuts especially since the government raised ratios to over 20% at the start of this year. Disclosure: Long CCIH. Please review the disclaimer page for more details. Any investor paying attention should know this last week was the busiest IPO week in the U.S. in years. The slate was headlined by well-known Facebook game maker Zynga (ZNGA), with secondary focus on Jive Software (JIVE) and luxury retailer Michael Kors (KORS). The rest of the IPO's had limited focus. Already knowing the issues with Zynga are similar to Groupon (GRPN) and Angie's List (ANGI), we quickly zipped past that offering (dropped 5% on first trading day Friday). Read Why Angie's List Shouldn't Be Listing for more details. MIchael Kors is interesting as well, but the stock looks pricey and investors already have plenty of luxury retailers to buy. The more I look at charts of the stocks I own and follow, I keep seeing a similar pattern of either strong support or the inverse head & shoulders chart. Not a technical expert, but viewing the charts gives a good picture of what the market thinks about a stock. Below are some of the stocks that appear setup for a inverse head & shoulders chart which would be very bullish if the stock can break to the upside. Most of them are on the borderline of the right shoulder extending too far so a resolution is likely on the way. Either a breakdown to test a double bottom or a breakout back to potentially the July highs. For many stocks that would be significantly higher. Weatherford Int'l (WFT) - oil services stock so not surprising that it has similar pattern to the OIH that Cramer profiled a few days ago. Lincoln Financial (LNC) - not a very well defined left shoulder, but it still has the same binary setup. Accenture (ACN) remains a key holding in the Net Payout Yields Model. After the close it reported earnings that beat estimates by $.02. Solid results as usual. Not much to say as ACN always reports solid numbers. The one issue worth noting is that it pointed out currency losses due to the stronger dollar in the last quarter. Not a big deal at this point, but it could become an issue down the road if the US Dollar continues to rally. Company only bought back $285M this quarter as well slightly lower than normal. This is the 2nd article in a series focusing on whether now is the time to invest in emerging markets. The first article which focused on India concluded that while some appealing stocks were at very discounted levels, investors need to wade into the stocks carefully, in order to not catch the proverbial falling knife. This article focuses on the largest Latin America economy, Brazil. It faces similar problems, where high inflation led to numerous interest rate increases by the central bank, leading to a slowing down of the economy. The major difference, though, is that Brazil has already been aggressive-- with three rate cuts of 50 basis points each-- while India is still pondering whether to cut rates. The country also has two potential catalysts, with the World Cup arriving in 2014 and the Summer Olympics in 2016. Both events will require large infrastructure spending that should benefit not only the economy, but a lot of the stocks traded in the U.S.
As I've been saying the last few months, the inflation scare was a tad overdone. A good part of the emerging market inflation had to do with plummeting of prices in 2009 followed by the sharp rise in 2010. This lead to the misleading year over year increases instead of looking at a smoother change over the last 3-5 years. Last night, India reported food inflation had dropped to 4.35% for the week ending December 3rd. This was the lowest reading since February 2008. Amazing that India didn't report any numbers below that for the rest of the crisis especially in late 2008 or early 2009. On top of this,, the economic advisor listed in the Reuters report expects a drop to 3% within a month. We're working on a series of reports focusing on the emerging market opportunities especially now as inflation fears come under control and central banks have begun loosening monetary policies. Were Joy Global Numbers That Bad? Joy Global (JOY) plunged 10.8% today after reporting Q4 earnings and 2012 guidance that apparently weren't pleasing to investors. Not sure I understand the disappointment with the numbers. It appears that JOY forecasted solid numbers for next year. Maybe expectations were too high, but that seems odd considering the European debt crisis. Sure management discussed demand concerns, but they were clear that destocking of copper and coal in China and India were basically over. Also, mining companies are better positioned to finance mining projects this time as compared to 2008. Not to mention that companies learned the hard way what happens when long term projects get delayed for a small term economic downturn. As I've tweeted about a few times, the market has numerous stocks set up with inverse head and shoulder formations. These are usually indications of a bullish pattern where a stock or ETF is the process of a significant breakout off a bottoming process. In most cases, the breakout corresponds with the lows from the July/August plunge. Assuming stocks form this bullish technical indicator, it can be expected to reach back to levels where the plunge began. In some cases this calls for a major rally. Naturally that doesn't seem likely these days with the European debt crisis and fears of a major slowdown in China. Unfortunately for most investors that is exactly why and when it happens. The least amount of investors expect a major rally in stocks so they all pile on the upswing. Boesing (BA) announced today its first firm order for the new 737 MAX fuel-efficient, narrowbody plane, from Southwest Airlines (LUV). BA claims this is the largest order ever which apparently passes a few other recent orders that I thought had the same claims. This industry appears ripe with orders, but deliveries remain a different story. LUV ordered 208 narrowbody planes for $19B (list price not actual price). This includes an order for 150 MAX aircraft that won't even start deliveries until 2017 (or '18 or '19 if the historical delay pattern continues). BA is reporting commitments for 948 MAX planes that could climb to 1,500 by the end of next year. This truly has to be the most interesting industry where customers order hundreds of planes at a time for delivery in 5-10 years. Makes me wonder if the industry won't eventually face stiff competition from a Brazil, China, or Russia made model that is able to make planes in a more timely manner. After a very cool summer in the markets, emerging market equities appear ready to emerge from the depths of massive losses for a warm winter. Inflation fears pushed investors away from the fast growing sector in droves in 2011, but now that inflation has begun easing now might be the time to return to the sector. Almost all of the emerging markets are down for the year, especially the leading BRIC markets. These inflation fears were somewhat misplaced since they were based on year over year comparisons of very volatile commodities. For example, copper prices soared to $4.6/lb in February which was a lot higher than in 2010, but only slightly higher than the peak back in 2008. Is that really inflation especially rampant inflation? Disclosure: Long IBN. Please review the disclaimer page for more details. Typically the Volatility Index ($VIX) does the inverse of the stock market. If the market plunges, investors seek protection and the $VIX soars. Today the market close down roughly 1.5% yet the $VIX dropped 2.7%. 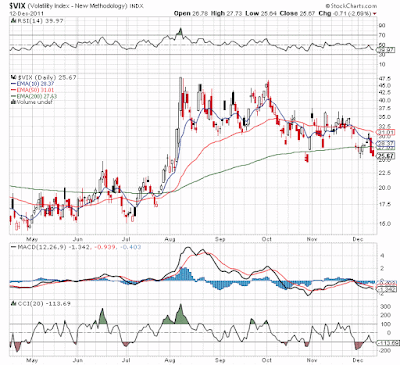 On top of that, while the market has churned the last 3 trading days, the $VIX is much lower. This could be a very bullish sign for the markets as less volatility tends to lead to better markets. Less fear and panic means investors are becoming more comfortable with the debt crisis in Europe. Maybe not more comfortable that all the plans will work, but clearly comfortable that the risks of a collapse have been removed. Anybody following this blog should know by now that C&J Energy Services (CJES) is one of our favorite stocks at Stone Fox Capital. As the stock dropped below $14 back in early October, we started thinking maybe our thesis was crazy. Now with the stock attempting to break above $22, its nice to see that a respected mutual fund manager is behind the stock. Bob Auer of the Auer Growth Fund looks for stocks with a 25% increase in earnings, a 20% increase in revenue, and ones that trade below 12 times earnings. Surprised that he finds many stocks like that other than a rare bird like CJES. Supposedly he grew $100K in 1986 to $34M by the end of 2007 by sticking to that strategy. 5. C&J Energy Services[CJES22.751.54(+7.26%)] is riding the oil-shale boom as a provider of a wide range of premium hydraulic fracturing services for oil-shale drillers. The company has a market value of $1 billion and a forward P/E of 5.1. Or at least that is the theory. Hartford Financial (HIG) dropped 8% today on the back of disappointing news out of Europe and supposedly the tepid news from the investors presentation today. The news out of the conference appears very bullish for the stock regardless of the headlines. The company expects to have core earnings of $3.45 next year which is generally inline with analyst estimates. More importantly though, the stock currently trading just above $17 has a forward PE. More importantly, HIG already has a book value of $46 and that will approach $50 by the end of 2012. Anybody buying at these levels would get an incredible 200% gain once this investment is valued at fair value. Trading at 1x BV has historically been low for the sector as well. Before anybody gets carried away, remember that when Warren Buffett buys something it's because the deal is too good to pass up. Or the seller might just be that desperate. In this case, it doesn't appear that First Solar (FSLR) was overly desperate to unload the project, but rather Buffett's MidAmerican Energy saw an opportunity to buy at an attractive price with locked in high power rates. Contrary to initial Reuters reports about the deal, this isn't likely a Buffett endorsement of the solar industry and if anything could be a signal that he and the executives at MidAmerica expect the solar model going forward to be not as appealing and possibly negative enough to limit supply. Would he really buy into a market where rates are going to crater due to oversupply? Well, maybe with a 25 year iron clad contract; though I'd be worried about the contract being voided if pricing deteriorated too far. Mitcham Industries or MIND supplies rental or new seismic equipment to the oil and gas industry, seismic contractors, government agencies and universities. It also manufactures specialized seismic equipment through its Seamap brand. Have never heard of this company before, but I was just blown away by the results reported after hours today. MIND reported earnings of $.52 versus and estimate of only $.22. It also reported 40% revenue growth to a record of $28M. Beating estimates by 150% is very impressive. The other impressive number was that leasing revenue jumped 116%. Not being familiar with this sector I can't provide much in the way of opinion other than the stock is benefitting from the boom in demand for higher resolution 3D imaging in the shale plays and increased utilization in Latin America. Is this just the start for MIND? Does it have a recently developed competitive advantage? Don't know, but would love to hear from any readers. Earlier today, Alpha Natural Resources (ANR) announced that it had reached an agreement with the government to resolve the civil proceedings resulting from the Upper Big Branch (UBB) mine explosion that killed 29 people. This event happened at Massey Energy back in April 2010 and subsequently ANR bought out Massey. The settlement for $209M hopefully allows ANR to move forward with less government scrutiny. One of the biggest issues with the coal miners in the Appalachian is higher costs from stricter regulations. The stock initially jumped higher at the opening, but has settled back to a 3-4% loss. Having this issue resolved should be good for the stock going forward. Who Is Going To Replace the Postal Service? With news the last week so that the USPS is planning to slow down 1st class mail, one has to wonder who could fill the void. After all, huge volumes of mail count on that next day delivery. Actually the facts were astonishing to me. 42% of mail reaches its destination within 1 day and just about all 1st class mail makes it within 3 days. That is a major portion of the mail that would now drop from 1 to 2 or 3 days. What about if the postal service stops Saturday delivery? Mail something on Thursday for a few blocks away and it might take until Monday or Tuesday to arrive. Considering the 52% premium that SuccessFactors (SFSF) received from SAP this weekend, it made us wonder if any other cloud software stocks were worth looking into. Generally the stocks claiming the 'cloud software' tag have lacked the profitability to warrant further research considering the normally lofty valuations. The summer sell-off and continued growth in the sector has made some valuations more compelling, especially considering the SAP offer premium. Remember that SFSF had massive 78% revenue growth in Q3, but the company only managed to report non-GAAP income of $8.6M. Based on $95M in quarterly revenue, that is a decent profit margin. Unfortunately though the company is a big issuer of shares for compensation so that the outstanding shares crept up to 87M from 81.6M. 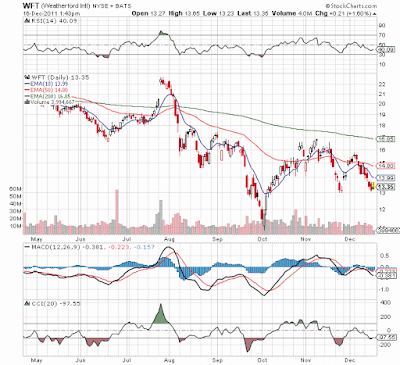 Emerging Markets Ready to Rumble Back? After a year of crumbling stock markets some live now exists in the Emerging Markets. The main culprit has been high inflation, but for numerous reasons that is in the process of ending. Are argument all along has been an issue in how inflation reporting focuses on the year over year numbers as opposed to inflation over time. For example, commodity prices hit the inflation numbers hard towards the end of 2010, but only when you compare them to 2009 numbers. But going back a few years to 2007 and all of a sudden the 'inflation' doesn't exist anymore. Naturally China has been facing wage pressure along with most other emerging markets, but a lot of this was due to the relentless focus on the spiraling commodity prices. Not that pries for copper and oil have stabilized and even dropped from early 2011 highs, the numbers will start showing year over year drops even if Brent remains elevated around $110.